The page for Rainforest Café menu prices. The Rainforest Café is a chain of themed restaurants serving casual American dishes including burgers, sandwiches, steak & chicken entrées, pasta, and salads. Guests can expect to step into a real-life rainforest that includes plant growth, waterfalls and life-size animatronic creatures such as gorillas, tigers, and jaguars. 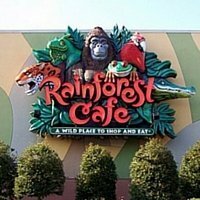 Besides the regular menu, Rainforest Café also offers a special menu geared towards kids. Below is the latest Rainforest Café menu with prices. All burgers and sandwiches are served with your choice of a side. Enhance your meal with one or more of our delicious add-on items. Any event at Rainforest Café is sure to be an adventure. Kids can have a birthday party and be the king or queen of the jungle. Social or corporate events can become tropical adventures at Rainforest Café. Through partnerships with local are schools, Rainforest Café helps educate students on rainforests, conservation efforts, and endangered species. Guests can request additional information online or speak with the restaurant manager. At Rainforest Café kids rule. Kids can visit the Wild Bunch Kids zone page to learn about the wild animal characters. There’s is Nile, Tuki, & Iggy plus a bunch more. Kids, be sure to ask your parents permission before surfing the Web. Membership has its rewards when guests join the Select Club loyalty program. Guests earn points every time they dine at Rainforest Café. Accumulated points can be redeemed for credit on subsequent visits. Guest earn points for joining and on their birthday. Other benefits include priority seating and member only special offers. To join is free and guests can join online. Guests that join the email club will be one of the first to learn about new menu items, special events or offers from Rainforest Café. Signing up is quick and free. Guests should visit the official website to sign up. Guests can visit the retail shop located inside each Rainforest Café location to purchase themed items such as apparel, bags & watches and kitchen & home goods items. As one of the leading full-service restaurant operators, Landry’s Restaurants Inc. is always looking for experienced candidates to join their team. Potential candidates must possess a strong work ethic and be high energy and self-motivated. Interested candidates should visit the Career page on the official Rainforest Café website to learn more about the company, the culture and browse the list of current openings and opportunities. The first Rainforest Café was opened by Steven Schussler inside the Mall of America (Bloomington, Minnesota) in 1994. The total number of locations in 1997 totaled 7. In 2000, Landry’s Restaurants Inc. purchased the Rainforest Café chain of restaurants. Today, there are 20 U.S. locations. Rainforest Café is a subsidiary of Landry’s Restaurants Inc. and headquartered in Houston, Texas. Fans of Rainforest Café can follow or connect with them through various social media platforms. For more information about Rainforest Café, visit their official website. I am a Laundry’s Club member and have been trying to make a Nashville Raintree Forest Café reservation for several times a day for several days at -615-514-3000 but the phone response is a recorded message saying “your phone call did not go through. Please try again”. I can not find an email address for you. I would appreciate confirmation of a reservation for Saturday 27 May at 5:00 pm. for a party of 4. adults. Prompt seating will be appreciated as we have tickets for the 7:00 PM Grand old Opry show.